The North Perry Avenue Water District works hard to protect your drinking water from contamination. This effort begins at the well where your water is collected, and continues through the entire treatment and distribution process. But what about after the water reaches your home or business? Who protects the water from the meter to your glass. Read on for some important information about the hazards of backflow, and what we all can do to maintain the safety of our water supply. 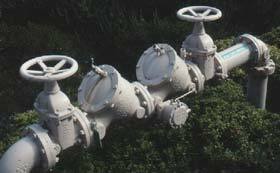 Backflow occurs when water or other substances flow in the opposite direction than intended allowing contaminants to enter the public water system or consumer’s plumbing. The following image depicts one way in which backflow can occur due to a drop in pressure in a public water supply water main. Please contact Courtney Little, Cross Connection Control Specialist at our office with any questions and prior to any installation.